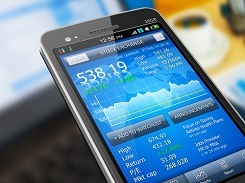 If you are a trader or investor who likes to monitor the stock market with your smartphone, you may be looking for the best stock trading apps for your iPhone or Android. In 2013, I re-published an excellent roundup of 10 of the best native mobile and progressive web apps for monitoring stocks and options. Since then, I have been continually updating and adding to that list. Although this article focuses on iPhone apps, Android users are not left in the dark because I have verified that nearly all the apps listed in the article can also be downloaded in the Google Play store. I remember when it cost a fortune just to receive real-time stock quotes on my computer. Smartphones? They didn’t even exist then. But technology has incredibly leveled the playing field for individual traders, who now have access to a wealth of various trading tools at minimal or no cost. TeleTrader, a surprisingly full-featured charting platform wrapped in the shell of an iOS or Android mobile app, enables you to easily monitor and analyze your stock portfolio on the go. I love this app and use it every time I’m away from the office. Oh yeah, it’s free too. One mobile app not on the list below that I really dig is from top-rated brokerage firm TradeKing.com (just $4.95 per stock trade or 65 cents per option contract). In addition to enabling you to place stock and options trades from your smartphone, the TradeKing app is fantastic for stock traders because account holders also receive free real-time quotes and advanced technical charting capabilities. Just shake your phone to refresh any screen. Very cool. Tying with TradeKing as my personal favorite smartphone app for stock trading is eTrade. Sharing nearly the same features as the TradeKing app above, the eTrade app is fast, sleek, and efficient. eTrade is also a convenient way to buy shares in 11 global stock markets. If you are an options trader, you may find OptionsHouse to be the most useful of the 10 mobile apps below because of the ability to place all types of options trades on the go. However, in order to use the free app, you must first have an active options house account (click here to open a new account and trade free for 60 days). ). I personally am not yet familiar with their app, but� Barron’s magazine is a very reputable and trustworthy source. I’ll be checking it out soon. Although I personally trade only stocks and ETFs, I know that� binary options trading has become extremely popular with traders in recent years because of the low amount of starting capital required, the ability to only determine whether a trade will go up or down, and the instant gratification of knowing whether or not your binary option trade is a winner within a matter of minutes. Most of the apps for binary options traders are simply for executing orders on a broker’s platform. But one app I find quite interesting, useful, and profitable is� Binary Signal App for Android. Providing live FOREX binary option trade signals of both a 5 and 15-minute trade duration, this app enables binary option traders to instantly receive push notifications of the best technical trade signals, based on a robot that has been tested to return an average win rate of approximately 70% (according to the company). Managing your investments can feel like a full-time job, especially in an economic climate that’s still struggling to rebound and that’s fraught with uncertainty. Thankfully, the mobile device in your pocket can prove to be a valuable investment on its own, and can be a powerful financial planning and investment management tool. These 10 apps can transform your iPhone from a mobile device into your own personal stock analyst, making a real difference in the way that you keep up with your stock options. MarketWatch – Gathering the most important financial stories, global market news, quotes in real time and analysis of the market each day, this free app from Dow Jones makes it easier than ever to keep up with the stock market, even when you’re on the go. Forbes Intelligent Investing – When it comes to trusted names in the financial world, few can compete with Forbes. That’s why this free app from the minds behind the venerable publication is such a must-have offering for both advanced investors and newcomers to the market. With video interviews and features relevant to the market, investment articles and panel discussions, this is one app you can’t afford to neglect. DailyFinance – Stock Quotes and Business News – Real-time quotes, customizable news updates from more than three thousand reputable sources, tracking for multiple portfolios and charting are just a few of the options you’ll be able to take advantage of with this free app. Keep up with all of your portfolios, monitor your investments and stay on top of all the trends, no matter where you are or what you’re doing. Yahoo! Finance – One of the most instantly recognizable entities in the online world, Yahoo! offers financial advice and news through their Finance outlet and a free app for your iPhone. Keep up with the stocks you’ve invested in, access a market summary, graph and compare currencies or markets, and keep up with commodities, industries and other financial realms while utilizing shake navigation for easy perusal. Morningstar – Called one of the “seven best free investing apps for 2011″ by Kiplinger, Morningstar is a gratis app that helps you keep track of your investments through insights, analysis and market research. Content for the free app comes from Morningstar.com, a trusted name in online stock and investing tips. Bloomberg – Find tracking tools, business and finance news, and information on developing trends in emerging markets, bonds, funds, insurance and technology with the free Bloomberg app. You can also tap into the Bloomberg Television Live function for global financial news around the clock, along with audio interviews from major players in the financial world. Stock+Option – Market Station Powers Stock & Options Research with Realtime Quotes, Chart and Data Visualization – Trade stocks and options from your iPhone device, along with incredibly in-depth tracking and analysis features with this top-of-the-line, complex app. Available from the App Store for $8.99, Stock+Option is one of the pricier apps on the market, but it is well worth the money for advanced traders and investors. OptionsHouse – In order to use this free app, you must first have an active OptionsHouse account. When you’re up and running, OptionsHouse iOS grants you unfettered, real-time access to your account from anywhere in the world. Make trades right from your iPhone, cancel orders, create watchlists and keep up to date on every facet of your investment portfolio with OptionsHouse. Stock Option Simulator – There are times when you want to test out your theories or learn the market before putting up any real money from your nest egg. That’s where the $0.99 Stock Options Simulator app comes in handy. Determine the risk associated with a particular option versus the payoff, then make a sound and informed decision. thinkorswim Mobile – Futures, options, stocks and forex can all be traded quickly and easily with the free thinkorswim app from TD Ameritrade. With a few taps of the screen, you can track events that make a difference to your bottom line, stream live financial news, modify orders and alerts, access real-time quotes and test strategies with minimal risk. Are there any financial apps not mentioned above that you really like? 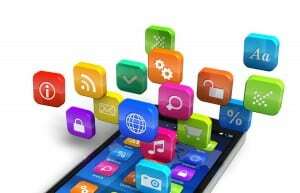 I would like to keep a continually updated and fresh list of the best smartphone apps, so please help by sharing your input in the Comments section below. Trader Q&A – Do we trade stock options? I use Stock Tiles Android app. It displays stocks in squares of colors from red to green relative to its stocks performance. It lets you see all your portfolio at one glance! Real time saver! Thanks for the heads-up on that. I’ll check it out. Is anybody using FM Trader App? There’s quite a few out there, which is why I wrote this article. Wanted to get a collaborative effort to find the best financial apps for smartphones, and then edit the post as the input and list grows. Anyway, will definitely check out your recommended Investing.com app. hey thanks for the post.. just would like to add there other apps for monitoring your stocks as well.. try ministock, it has been my favorite app on the go.. Thanks, will check that one out. I think among the 10 top iPhone apps for stock traders should be “Stock Fcsts” and “2Stock Fcsts” to be launched on December 12, 2013. These apps forecast stock prices by treating stocks like species and the stock market like an ecosystem! An iPad version is allready selling in the App Store under the name “Stocks’ Futures”. Thanks for the suggestion, Theodore. The best iPad app I’ve ever seen is Daily Stocks Pro. Thanks for the heads up. It indeed looks like an interesting financial app with the candlestick chart pattern stock scanning. I wish android had an app like” stocks live” but it in only on ipod but it is the best I have used. You should check out http://www.bastaware.com. A simple but strong, easy to use app. It has a clear and simple overview of intraday prices – and a supporting website that has the same functionality as the app. The “missing step” company makes a bunch of apps. Some are a little pricey. I use stock signals and stocks pro. Very customizable charts and rapid news info. Also seeking alpha gives decent information. Good to know. I’ll check these out. Thanks for your feedback. For traders that focus on stock charts with Bollinger Bands and technical indicators, the Bollinger Bands app for IOS and Android is very powerful. It provides features found on sophisticated financial software for your phone or tablet, including charts with 50+ indicators, stock screening, industry group and sector analysis, and audio expert technical analysis of chart patterns for easy listening, or text if you prefer to read. The Bloomberg and Yahoo! Finance apps are very good and useful. I use them on my iPhone to get info on the markets throughout the day that are newsworthy. For trading apps, there was a very good trading simulator at http://stockthrust.com that I enjoyed using. It was free and allowed me to practice trading. It helped me a lot. The site also is good for getting a bigger picture on stock price movement. Another good app I’ve used is the Mint app https://itunes.apple.com/app/mint-personal-finance/id300238550?mt=8 which lets you track all your financial accounts in one place. Very useful and is also free. They got some good articles there too. Thanks for sharing. I use Bloomberg to keep a general eye on things with nice overview, but will check out the others you mentioned. Thanks for your research. I wrote Stocks Live for the iPhone three years ago, I make updates almost every month with new features, it is featured by Apple in App Essentials for Money Management. I have over 50 features and 1000 market scanner. Unheard features like heart visualization, Twitter client built in, dancing heat maps tiles and what-if scenarios. Thanks for the heads-up on this app. Sounds unique and I will be sure to check it out. I need which mobile best for treding stock. I am not an options trader rather than willing to become an options trader. I am not watching some live seminar of Dan Pasarelli of Market taker mentoring and try to learn about options trading. Could you please help me how the apps for stuck will help me in this regard? Please email me your suggestion. If interested, I would love to chat. Simple and powerful, can sync with Google Finance. So many apps just give price quotes and a bit of news. This one fully tracks the value and gain of the portfolio and individual stock holdings, with detailed profit breakdown and also an integrated portfolio cash account. So far it’s the best I’ve found by a long way. Recently downloaded the app MajorGainz and found it to be quite impressive with live updates of both BSE and NSE and of the various shares..
Did you see this app ? Thanks for sharing your favorite app. Since you like Stock Screening apps, you may want to give the Morpheus Stock Screener a test run. The app is presently running on HTML5, which means it runs on your mobile phone as a website, but the native mobile app version of it coming soon. Take the screener for a $5 trial run at http://screener.morpheustrading.com. I second the vote for MOMO stock app http://www.mometic.com for IPhone. It is the only app that I know of that streams realtime highs and lows. It also actually works in extended hours and is great fun to use during earnings season. I also like StockTwits and trading view. We have created a mobile app that presents Finance Markets data in a fresh and intuitive way, short description below. @Marcus – Thanks for letting us know about your new app. I’m gonna check it out.